If I flick through the pages of these books, there is a noticeable similarity in content and style. I enjoy all these books and they continue to be a source of reference and inspiration. However, I’m already a convert to growing your own veg. A few weeks ago, I was hugely excited when Paul Matson, co-author of SowHow: A modern guide to grow your own veg, made contact to offer me a copy of the book. Having been thrilled by the sight of a number of the book’s pages through the Twittersphere, I couldn’t decline. The first thing I valued about SowHow is its size. The A5 hardback is a character contrast to other grow-your-own texts. It’s not small enough to diminish the stunning graphics within its pages, but it is small enough to be portable – and that’s how I feel it should be. This is a gardening reference book you just want to carry around. When I first started growing my own, I was completely naïve to gardening. There’s clearly a place for the dense texts on allotments and kitchen horticulture, but not in the beginning. 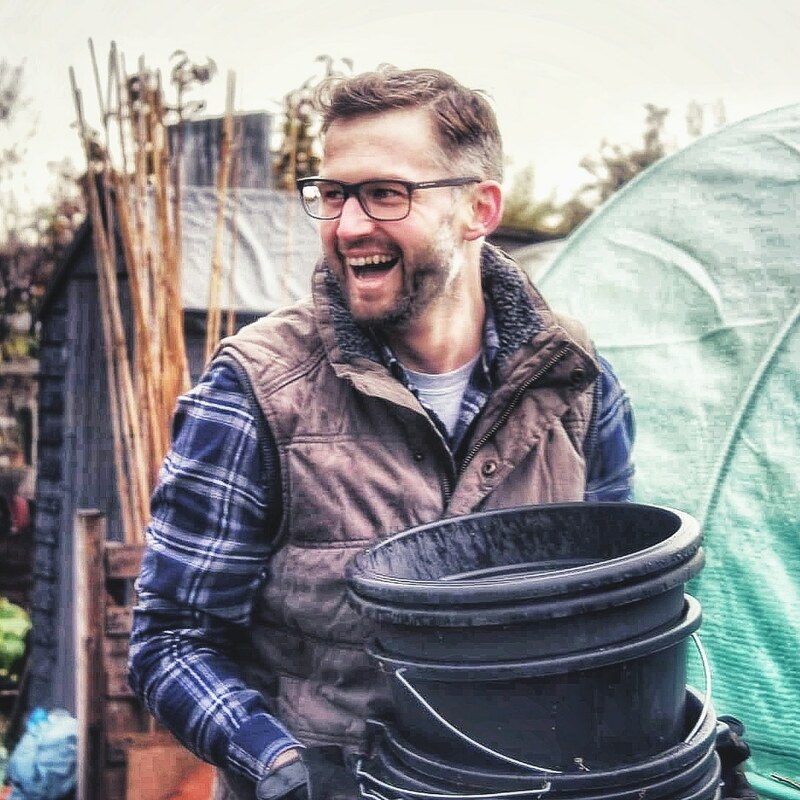 If we aim to inspire and enable non-growers to join in this movement (and I certainly try), we have to give them what they need – simple, easy to understand guidance, presented in a format they enjoy and that gets them effectively to their first, tasty, home-grown veg. This isn’t to say this book is without the ‘other’ stuff necessary for successful kitchen gardening. No, SowHow covers a heap of content including soil preparation and compost, cultivation methods, tools and companion planting, all cleverly covered in a visually appealing and information efficient way. The material in the book isn’t new to me – but when you have a period of experience of growing your own fruit and vegetables, what book on the subject actually does provide that at a fundamental level? Yes, of course there are new ideas, different techniques and other ways of doing things – if the numerous books on the topic, published and purchased each year didn’t provide that in some arrangement then we’d all just own a copy of say, Beeton, and never evolve our understanding or become inspired to change our approach and try out new ways, or new crops. Besides, this isn’t the point of the book. Everything about SowHow is contemporary. The beautiful design and clever infographics that fill the book’s 200 pages are not only aesthetically modern, but the style of the book fulfils modern society’s craving for information in a resourceful and accessible format. Paul Matson and Lucy Anna Scott have created a book that simplifies the core ideas and processes of grow your own gardening and it’s superb. The beauty of framing SowHow in the context of new to growing your own is the experienced growers among us get the same benefits too. We will, no matter our level of experience, always need a point of reference. The brilliant format of the book means it’s easy to pull out of your coat pocket and get that necessary information quickly. The simplistic, visual approach is what makes this book so appealing. The information provided for each vegetable isn’t just on the matter of when to sow, how to do it and what’s needed for successful cropping, there are unique elements such as how long seeds for each vegetable will store and easily identifiable crops to grow in pots too. I love the SowHow’s ethos of inclusiveness. Not only are crops for pots easily detected, but a section of the book titled ‘make your garden anywhere’, provides a selection of ideas for growing crops without the luxury of an allotment or large garden. I highly recommend this book – not just for newcomers to grow your own, but to anyone at any level. I genuinely believe SowHow will be a text I will use more often than any other of the books I own on the topic of growing your own. This looks great! Definitely on the Christmas list! The growing calendar looks nice and simple too! It’s a wonderful book. The graphics are fantastic. I love how portable in is too.